Perfect accent to our Ocean Waves bedding collection. 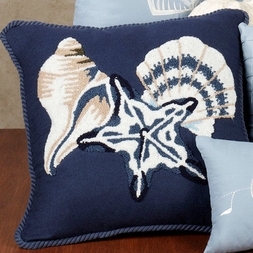 The ocean blue Starfish Shell pillow gives a relaxing, beach feel to your decor. The details include a richly designed hooked wool center depicting a beautiful Starfish and two complimenting sea shells, edged with nautical corded trim.